One of my goals for Jumpstart January is to eat two meat-free meals each week. 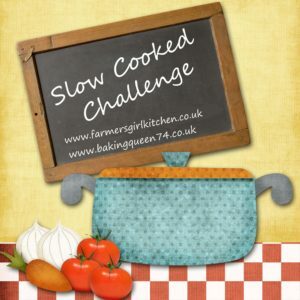 Slow Cooker Greek Baker’s Pot is one of the dishes I’ve made to help me achieve my goal, it’s based on an old Greek country dish eaten during Lent when meat was not permitted. Many families didn’t have an oven so they sent their casserole to the local baker to be cooked overnight in the heat remaining in the baker’s oven. 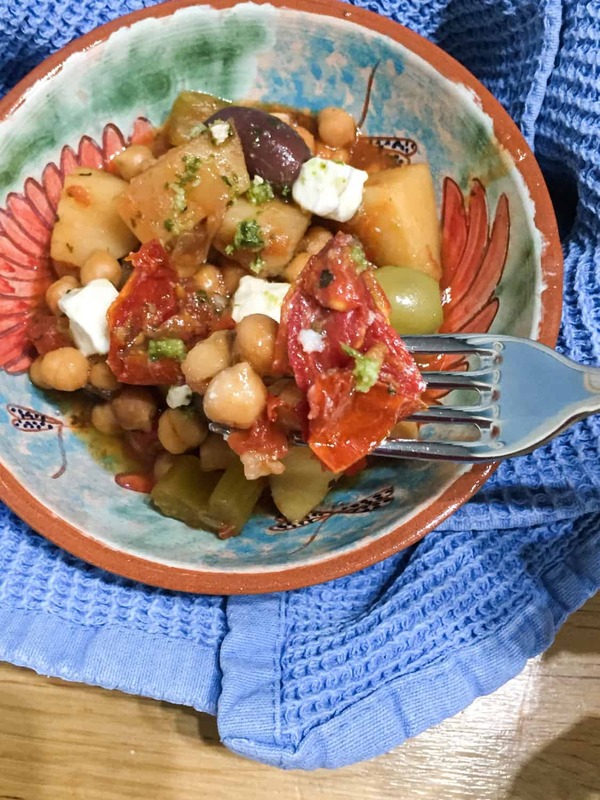 The traditional Greek Baker’s Pot would have slices of potato baked as a ‘lid’ on top of the chickpeas and vegetables, but I decided to chop the potatoes into chunks and cook them along with the other veg, as I think that works better in the slow cooker. Other than soaking the chickpeas overnight, you only need to saute the onions, all the other ingredients can go straight into the pot where they will bubble away all day while you go and do other things. Serving food in bowls is trend for 2017, and this dish is made to be served in a bowl. It’s the perfect comfort food hug! 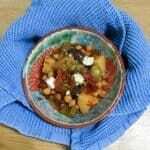 A traditional Greek casserole made with chickpeas adapted for the slow cooker. In the morning, heat the oil in a saute pan, large frying pan or if you have a Sear and Stew Slow Cooker with a metal bowl, you can use it direct on the heat. Fry the onions over a medium heat for a few minutes, add the garlic, celery and red pepper and cook for a few minutes more. Put the vegetables into the slow cooker and add the chickpeas, tomatoes, stock, potatoes and herbs. I had a few sun dried tomatoes left over in the fridge so added those too. You can add any bits and pieces you have in the fridge to the Greek Baker’s Pot, I had a few olives, feta and sun-dried tomatoes, which definitely add to the flavour, but they are not essential and the dish will stand on it’s own. What would you add to the basic dish to make it your own? I’d never have thought about putting feta in a casserole but I can totally see how that would work! Best to add it near the end of cooking, but it works really well with the chickpeas and olives. Love the look of this – minus the Olives for me, for some reason they give me the heebeegeebees! Really? I adore olives, but then I’m not so keen on Fanny’s aspic! You can add whatever you want to this dish, or not! That’s its beauty. What a delicious meal Janice, I think the addition of the feta, olives and sundried tomatoes makes it really special. Love the flavours in the dish and the pots baking in the bakers oven in the evening is a lovely tradition. Aw thanks Katie, I think I’m a peasant at heart! I love all the traditions in which the community bakery also served as an oven for families nearby. This adaptation for the slow cooker looks delicious. Thanks Kavey, I love those things too, pity they don’t still have them! This is a lovely looking meat free meal. And I love the Greek foods. Looks like a very handy food for this January. Thanks Michelle, it’s a really easy way to fill up! This looks really wonderful. But I’m not meat-driven. This is my kind of meal! Thanks Mimi, slow cooking brings out so much flavour. I am at mum’s house for January, but I will try to join in Janice! And, I LOVE the look of this meat free Kleftico too! What a delicious recipe Janice, I love the sound of the feta with the tomatoes and olives. I like to eat meat free meals a couple of times a week too so this is going on my to try list. Thanks Sarah, it’s what we enjoy too! great recipe thanks for sharing . Oooh now this looks good! I love the addition of feta.